Most people in the Green woodworking scene will be familiar with the work of Peter Follansbee. If you're not aware of Peter's work then stop reading this immediately and head over to Peter's blog, you won't regret it (but you might not come back here for a while). Peter's side-axe is legendary. It's an important tool for his prep work and unfortunately 'they don't make 'em like they used to.' Peter regularly gets questions about his axe and he has produced this video to show some of the possible alternatives. 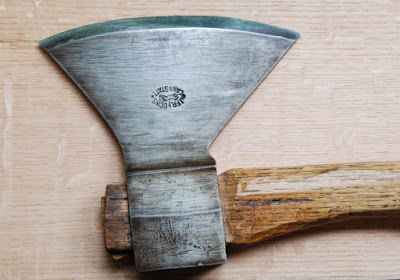 One day whilst trawling a popular online auction site I came across a vintage side-axe that looked like it might be perfect for this kind of work. It was going at a reasonable price, so I took a chance and bought it. When it arrived I quickly realised that I had made an error. The shape of the axe was perfect. The edge geometry was exactly what I was looking for. The problem was that it was huge. I had neglected to look at the weight of the axe on it's description. The heaviest axe that I use regularly is the Gransfors Swedish Carving axe which weighs 1kg. Peter's is a bit heavier at about 1.6, but this one weighs in at a whopping 2.3kg. This axe is HEAVY! A few years ago I suffered from a bout of tennis elbow. 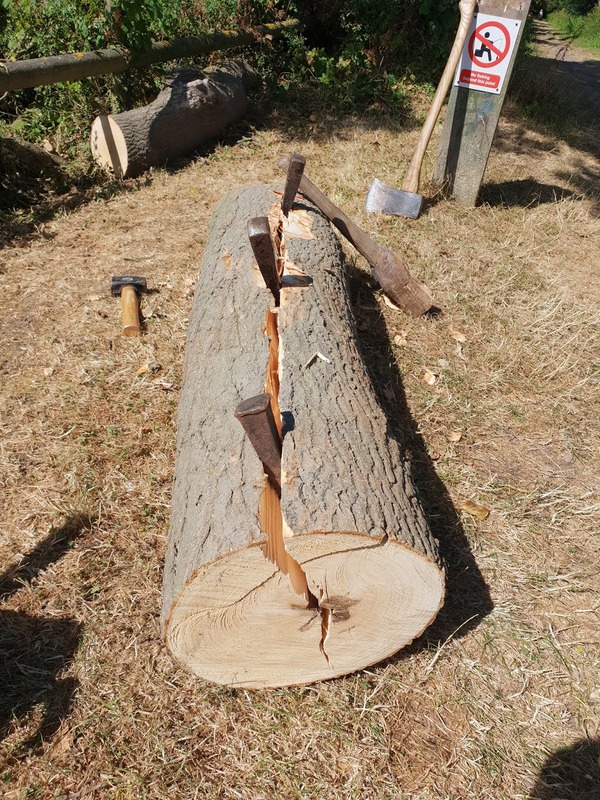 Throwing an axe around all day can be quite a hard physical work out and I assumed that because I don't do this full time I had pushed myself too hard. That year whilst at Spoonfest I attended a talk by Terence McSweeney, green woodworker and professional Osteopath. One of the questions that was put to him was how to avoid tennis elbow (it seems that this was more common than I thought even among full time woodworkers). Terence's answer was that the problem was probably that their axes were too heavy (cue gasps from several affronted axe wielding spoon carvers). He explained that our bodies are not designed to work at full capacity for extended periods of time and therefore if we are using our heaviest axes all day, then our arms are under a lot of strain. What Terence suggested was that we build up our strength by sing a heavier axe for a short period and then when we return to or regular axe we are not working at full capacity. So this has become my workout axe. Ironically this axe used to belong to Terence McSweeney. If he was using it for similar purposes, then the axe that he has now worked up to must be a beast. I knew I hadn't posted much recently - in fact that's understating it - I knew I hadn't posted anything for ages. And I knew I hadn't posted for ages because I haven't actually carved anything since the Countryside Show in Leicestershire last August! When I went to look at the blog to see what was the last thing posted I thought "good, Julian has posted recently." It wasn't until I looked closer that I realised what I had thought said July 2018, was actually July 2017! We really are rubbish at this! That's not to say I haven't done anything. I have done some black-smithing to make pattern forged steel and I have made several knives and a bit of leather-work, but I find I have less and less time on my hands for these activities and have decided I need to make a concerted effort to do more. 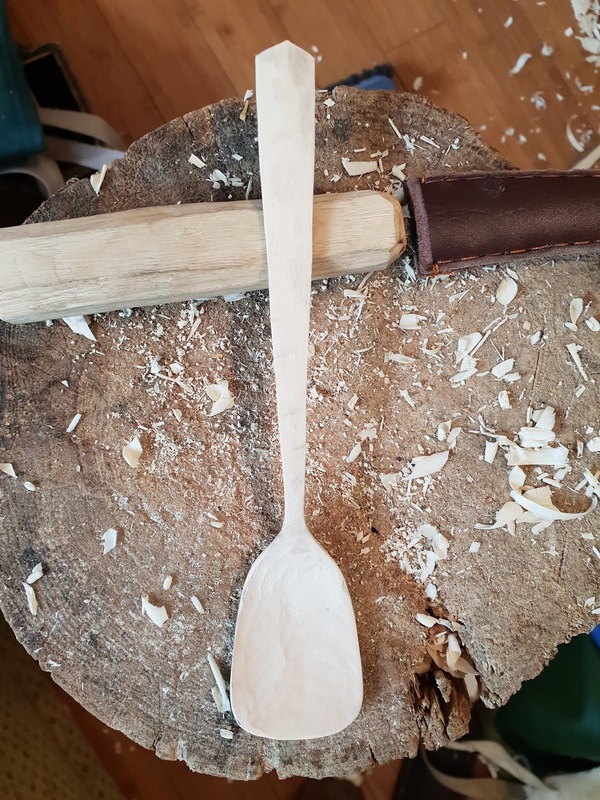 So, here is my first spoon in a year. 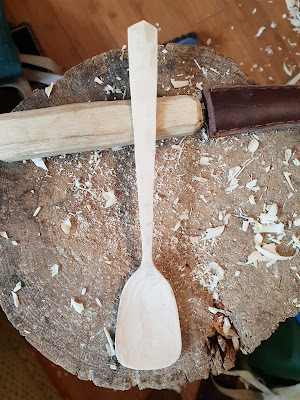 It is not the spoon I intended to make, but my first effort split right down the middle - my recently split billets of 'green' wood have suffered the very warm weather we are enjoying and are as dry as match wood. Nonetheless, here is my day's effort. It is one of my favourite spoon designs - I call it a coffee paddle. It is thin and delicate, with a subtle crank and just the thing for making and stirring hot drinks. It is not all I did today. I had noticed on a walk recently along our local canal, that someone had done some work on the trees at one section, and left some rather large sections of what I am guessing is probably a willow of some kind. 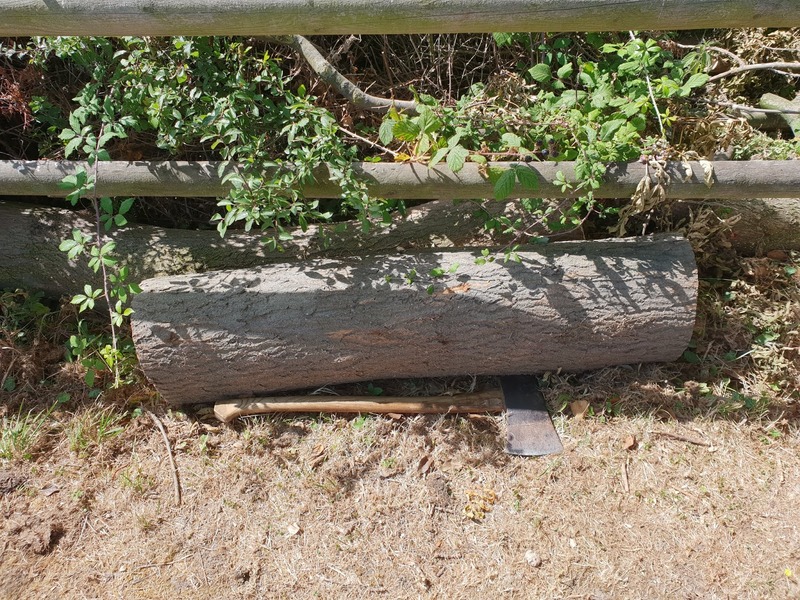 The best of the pieces was too big and heavy to carry so I went out early this morning with the intention of splitting it into quarters or eights so I could bring some home, maybe to use as bench legs. I set to with axe and wedges, only to find that the wood inside twisted so badly that it took me best part of an hour to do the first split (and retrieve my wedges which at one point were horribly trapped within the twisted fibers). 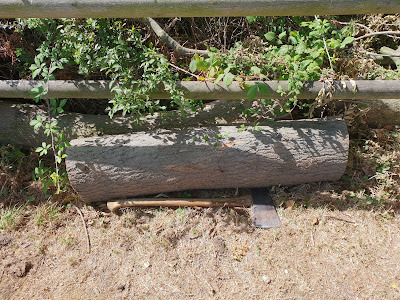 Looking at what I'd got, I figured this was potentially a lot of effort for what would no doubt end up as fire wood and so I cut my losses - it beat me, I admitted defeat. I really should have looked more closely at the position of the sap wood at either end of the log and would have worked out before I'd stared that it wasn't going to be straight. Oh well, I still get so excited over a length of free wood that I don't always think logically, and I'd like to say I've learned my lesson and will be more circumspect in future, but I know that's probably not true! Now, let's hope I can actually remember how to post to the blog. This is the most amazing chair in the world. Not because it is particularly nice to look at or because of its flawless construction, this chair is amazing because it exists. The fact that I actually managed to complete this chair is a miracle. There were several things working against me; firstly there is the problem of time. As a full-time History teacher with a young family it is sometimes difficult to find large blocks of time to do woodwork. This isn't so much of a problem when it comes to my usual work: bowl turning, spoon carving and other small projects that can be finished in an evening. It was much more difficult to keep momentum with the chair, especially as I was spending a few hours working and ending up with only a pile of sticks to show for it. There were also tools that I needed to acquire and sourcing the right materials too, but by far the biggest obstacle was the fact that I'm a bit of a chicken. Cautious is probably a better way of putting it. Whenever I try something new I like to read about it first, then I like to read something else about it and then, before I start I like to read about it. This was no exception, in fact the journey started with this post about several books that I'd been reading in preparation, that was two years nearly before the chair was finished and I included several other books in-between, in fact I could probably just pile up my chair-making books and sit on them. Something that made me even more cautious was the fact that this was the first time I had ever paid for wood. Usually I manage to salvage logs from tree surgeons and friends, but this needed something big for the seat, so I bought a slab of ash for £40 that I thought would be big enough for at least one seat. 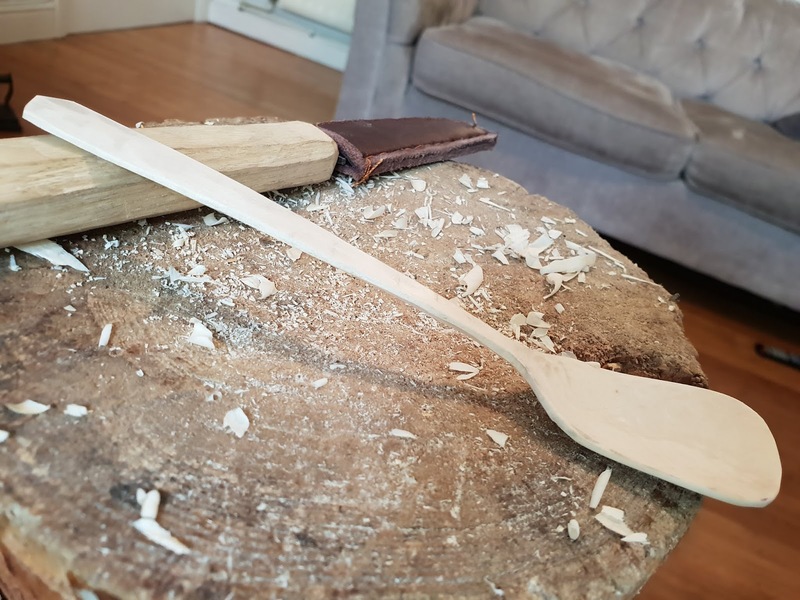 I'd decided to make a Welsh stick chair for a few reasons, the most important one being that in their traditional and purest form, these were unique chairs made by the user. This is what Bill Coperthwaite would call a democratic chair, or an anarchist chair according to Chris Schwarz. This is a concept that really resonates with me. The second reason is that they allow for a bit of rustic charm and I felt that my skill level could cope with that. As a result of this decision there were no plans to work from and instead I decided to use this picture as my guide. This turned out to be a much more difficult approach than I had anticipated as I didn't have a single measurement or angle to go by. I should have worked out one measurement and then scaled everything up, but I didn't, I just made it up as I went along. So, in December 2015 work began when I went to a friend's house to split up some big oak that had been taken down in his back garden. Working with this oak was absolutely fantastic, but I quickly learned an important lesson: straight trees don't grow in back gardens. As I was riving and shaving the Oak down to size I realised that there's straight and there's straight and with no real competition for the light, back garden trees are a bit slouchy. This was even more visible with the Ash that I decided to use for the legs. This had come from the garden of another friend and as a result the front legs are a bit like bananas, but that's ok, as my Dad used to say whenever his DIY efforts weren't perfect "we'll make a feature of it." 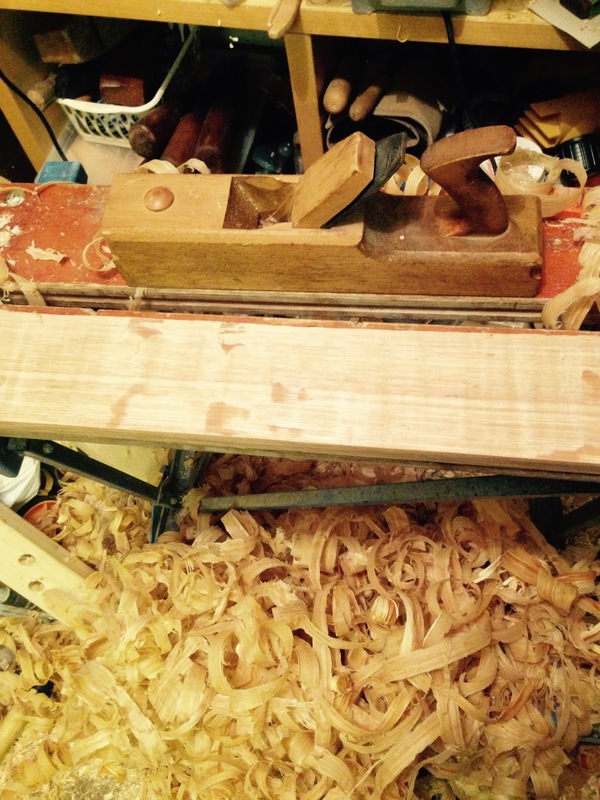 One of the most enjoyable and frustrating elements was making the crest rail. This involved hewing and then planing a section flat and square, which I'd never really done before. Peter Follansbee's book on the joined stool was a big help here. Planing the green oak was one of the most satisfying things I've ever done. The smell was amazing. After getting it to the right dimensions, I then had to steam it and bend it to the right curve, again, something I had never done before. I ended up having to do it four times as the first two weren't the right curve and the third one broke whilst I was bending it. This slowed me down more than anything else. Bending jig mark 1 (not long enough and not enough curve. This was the final version that just about worked. Shaving the legs and the spindles was good fun, but I did a lot as I wanted plenty of spares in case something went wrong. I'm pretty sure this was responsible for my tennis elbow, something which slowed things down further. Boring the holes in the seat was probably what made me most nervous as I didn't want to ruin this precious wood that I had paid for. I made a model as recommended by Drew Langsner, so that I could work out the compound angles and then I worked slowly. This model made from MDF and coat hanger wire helped me to work out the angles of the legs. By May 2016 everything was ready except for the crest rail, which, as I mentioned previously, had to be remade for the fourth time. Then Summer happened and the whole project was shelved until December, when Richard came round and we finished the project off together. I was tempted to paint it like the one on the picture that I used for inspiration, but in the end I just finished it with Danish oil and a beeswax paste. We had a lot of people round for Christmas (17 for Christmas dinner) and so it got a lot of use and approval. The boys love it and will often argue over who gets to sit in Daddy's chair. If I speed things up a bit, I might be able to make them one each before they move out. 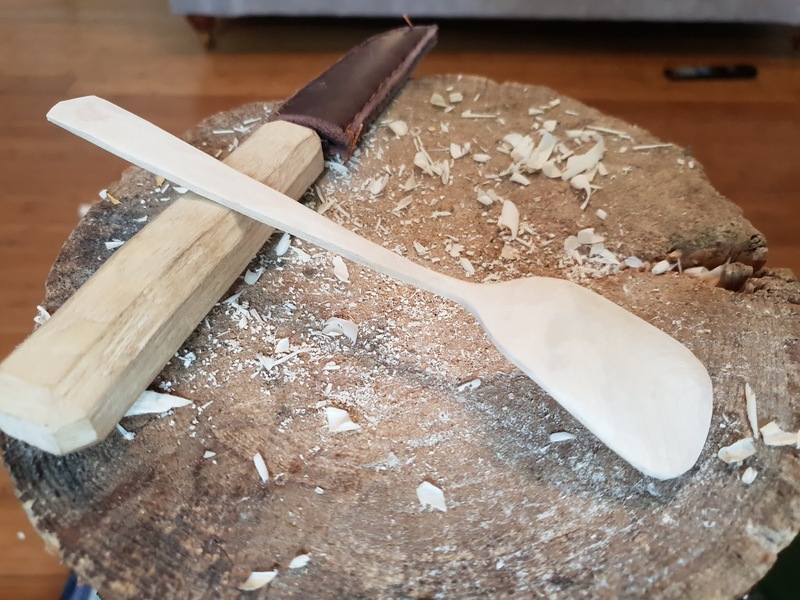 For some time, it seems, if you wanted to get into spoon carving, then there were only really two books that showed you how in any detail, and they were both out of print and hard to get on a sensible budget. 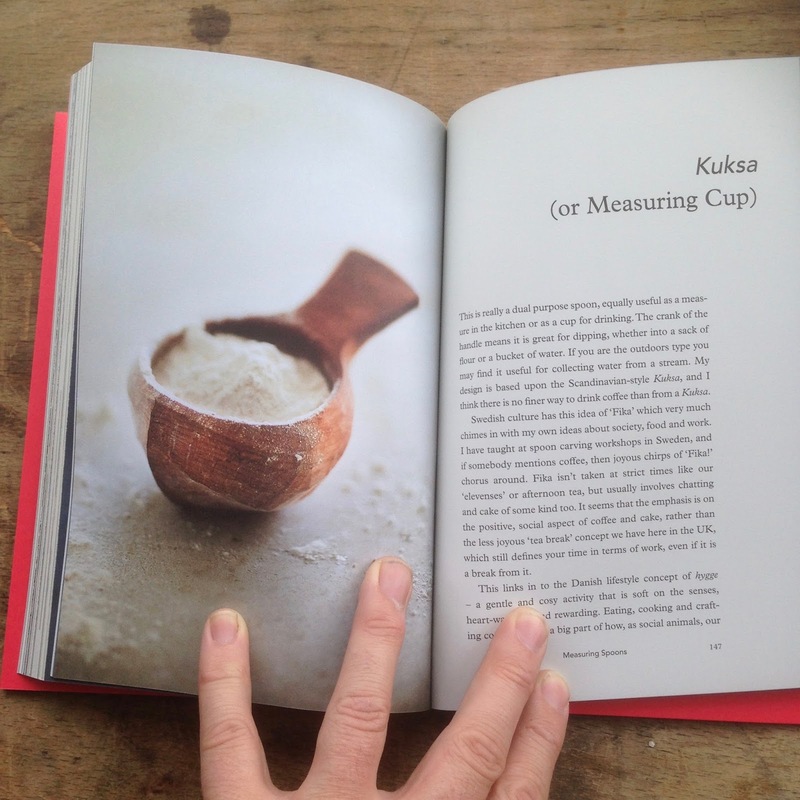 The modern spoon maker/bibliophile is spoilt for choice, with no less than three books being released this year alone. Spon, by Barn 'the spoon' Carder is the latest one to hit the shelves and it is a must for beginners and experts alike. If anyone is qualified to write a book about carving wooden spoons it is Mr The Spoon. Barn spent several years travelling the country, sleeping in the woods, carving spoons on the streets and peddling his wares. It was at this time that I first found out about him from Robin Wood's blog and contacted him offering him somewhere to stay, if he was ever in the area and fancied a rest from sleeping under the trees. It seems this offer may have frightened Barn as not long after this he moved to the city and took up residence in a traditional dwelling known as a house. Barn is co-founder of Spoonfest, the first international spoon carving festival, and he also opened his own shop in London that sold, guess what? That's right, hand carved wooden spoons. He even has his own Wikipedia page. 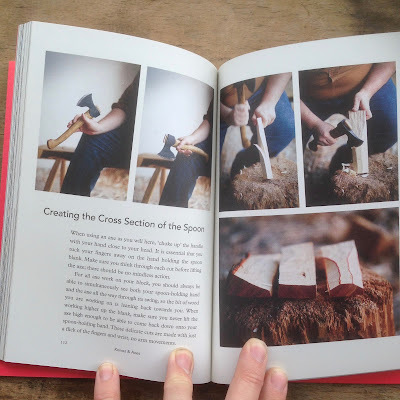 The book is well designed and beautiful, but has a raw, almost handmade feel due to the uncovered end boards. There are loads of full colour photographs to help teach and inspire. After an introduction that is romantic, but at the same time pragmatic as he extols the virtues of his craft, there are chapters on wood selection, tools and a step by step guide to carving your first spoon. What I really love about this book though, is the second section which contains four chapters looking at sixteen different styles of spoon. 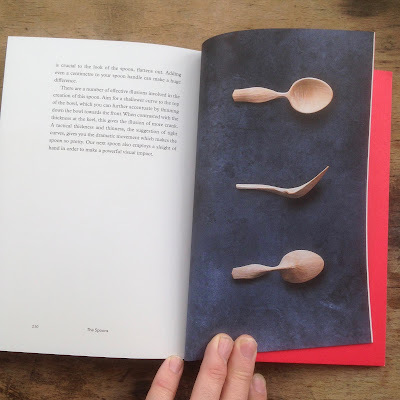 Each spoon in this section has its own little essay on the design features and how to create them, as well as photos showing the spoon from three different angles. 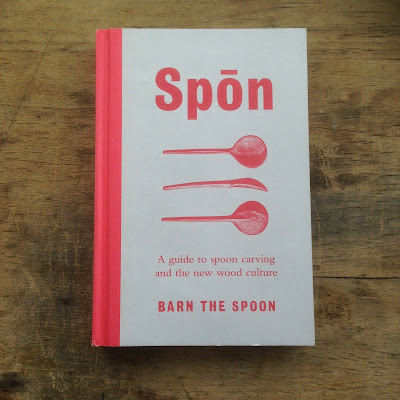 This is incredibly helpful for someone that is trying to improve their carving, seeking inspiration or trying to copy Barn's spoons and pass them off as originals. Seriously though, I think that copying someone else's spoons is a great way of improving your own carving. 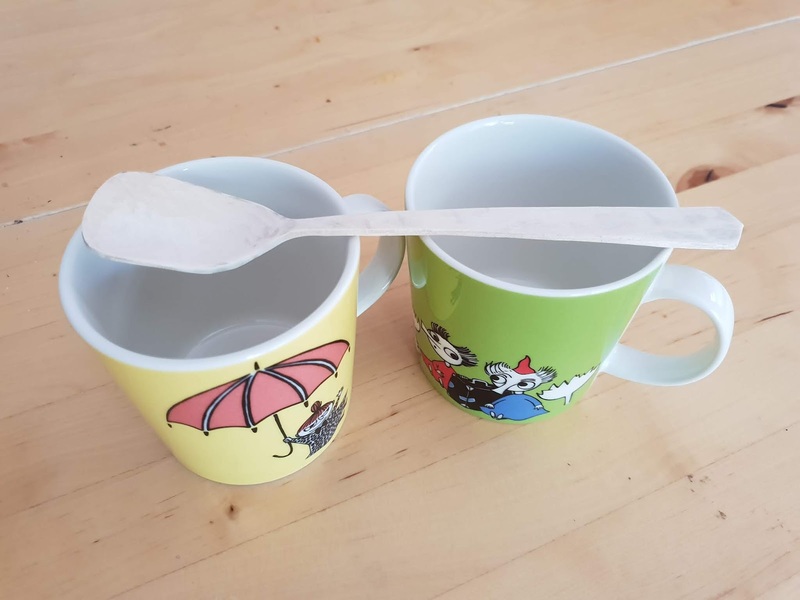 Ideally you would have the actual spoon to copy, but this is the next best thing. For those that want to take things even further, Barn is now creating videos of how to make the sixteen spoons in his book as well as other spoon making tutorials. He has already finished several of them and you can view them by subscribing through the Green Wood Guild. You can purchase Barn's book here. And subscribe to the videos here. I first heard about Nic Westermann on the Bushcraft UK website, At the time there were only a handful of people producing greenwood working tools and it seemed like a prerequisite to making them was being Swedish. Nic's spoon knives were starting to create a bit of a stir and he was posting pictures of some fantastic carving axes. Fast forward several years and Nic is arguably the most respected tool maker in the greenwood working community. Last year Richard and I spent a day with Nic in his workshop forging axes under his expert guidance. I'd met Nic a couple of years previously at Spoonfest and he struck me then as being a very nice and down to earth kind of guy. He kindly offered to let us camp in his back garden the night before so that we could make an early start the next day, so we arrived at his house in Wales at about 5pm. Nic had warned me that I should probably bring some insect repellant as it can get a bit midgey this time of year, advice that I stupidly ignored. I've never really been a victim of insect bites, when those around me have suffered I've always emerged unscathed and felt somewhat smug as if being unattractive to biting insects was some kind of super power. However, I had obviously never encountered the particular breed of insect (which I can only describe as pure evil) that inhabits Nic Westermann's garden. After 10 minutes of struggling to put up a tent whilst performing the insect dance, we ran like a pair of teenage girls being pursued by a rabid mutant dog and took shelter in the car. Nic came to the rescue and kindly let us sleep in the back of his van, which was midge proof and very comfy (though I'm sure that if I strained my ears I could probably hear the sound of a thousand tiny collisions on the side of the van as the nasty beggars tried to break in). The next day we woke early, had breakfast in a charming little roadside cafe and then headed over to Nic's workshop. Experience had obviously taught him what was achievable in the available time and so he gave us an overview of the proposed timings of the day that would enable us to forge an axe head each, grind them and heat treat them and hopefully finish at decent hour that evening. Now I'd watched Nic forge an axe in under an hour whilst demonstrating at Spoonfest and in my over-active imagination I could hear the distant voice of Nic a few hours in the future saying something like: "Wow! you guys are naturals, you did that really quickly, we've still got time to do a couple of spoon knives, some gouges and if you keep this up we'll be making adzes before the day is through." I'm such an idiot, did my near death experience after failing to heed Nic's bug repellant advice teach me nothing? Nic knows what he's talking about. Nic is a fantastic teacher and coming from two professional teachers I think that is considerable praise. He takes something that is quite mystical by nature and approaches it methodically and in stages that are easy to understand. In fact I think Nic has a gift when it comes to his analytical approach to tool making. This has allowed him to refine his tools and his processes and it is probably what has earned him the deserved reputation that he now enjoys. The day flew by and I think that Nic was genuinely impressed that we had only taken about an hour longer than we planned. At the end of the day we had both finished and were as pleased as two very pleased people with scale burns and midge bites up and down our arms and shiny, razor sharp axes. To be honest though there was one drawback to the day. About a month beforehand I had developed tennis elbow and so lifting a heavy hammer repeatedly was quite painful. Fortunately Nic's method meant that most of the heavy work was done by the striker and I would just have to move around different punches and forms, but even this hurt at times. Nic was very understanding though and was always there to step in when needed. He even acted as striker for Richard. All in all the day was great fun and a bit of a dream come true for me and Rich. I would love to have a go again and even have plans to set up my own forge in the future. Until then I might sign up for one of Nic's bladesmithing courses with the Greenwood Guild or even try axe making with him again, this time, hopefully, without a dodgy elbow. In the words of the late great George Harrison: 'It's been a long, long, long time'. I'm not going to apologise for not keeping up with the blog, because I've done that at least once before and I don't want to come across as insincere. I do feel guilty though. I try to post quite regularly on Instagram and I'll often share those posts on Facebook, but I've neglected the Holt & Heath Facebook page and especially this blog. I will try to do better. It's been about 8 months since the last post, so I'm sure you can imagine that a lot has happened. 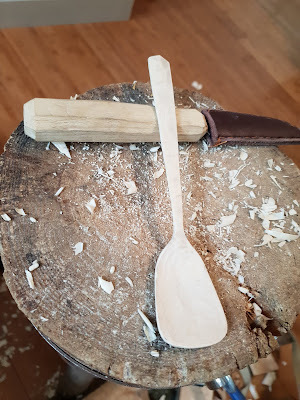 I'm still carving spoons and turning bowls, but have also finally managed to finish my Welsh stick chair as well as a few other items of furniture. I've been on a few courses including a fantastic day with the ultra talented Nic Westermann forging an axe. I've also read a lot of books. Some about woodworking, some that are about how to live a better life and some that are about both. I'll try to share my thoughts on those too. So, I've got a lot of catching up to do. I'm not going to write an epic post now, but watch this space and hopefully I'll get back into the swing of things. This year was our third year at the Leicester Countryside Show (formally known as the National Forest Wood Fair) and the first time that we didn't have torrential rain. At the moment we only do two shows per year and with the disastrous weather we had experienced at the last two Leicestershire shows it was very nearly just the one, but I'm glad we went as the weather was fabulous. One of our customers was Chris Fleming, a fellow woodworker who makes beautiful furniture and also does some green woodworking including some really nice shrink boxes. You can check out his website here. I chatted for a while to Chris and his wife, who seemed to be a really lovely couple and I was flattered when they bought one of our bowls, but what I appreciated most was that they pointed out that our bowl display sucked. I'd recently spent a bit of time putting together a new spoon display, which I think worked, but the bowls were just kind of plonked there. I will definitely give it some more thought for the next show we do. Any advice would be welcome. One of the things I tried for the Leicester display was labels made with this fantastic Dymo label maker that I picked up at a carboot sale at the beginning of the summer. I've always loved the effect of Dymo labels and I've found a few vintage ones over the years, but I'd never seen one like this chromed metal beauty. Unfortunately the labels were a bit small and not entirely practical. So I'm now looking forward to coming up with some new ideas for next years shows. At least our sign was a hit again.